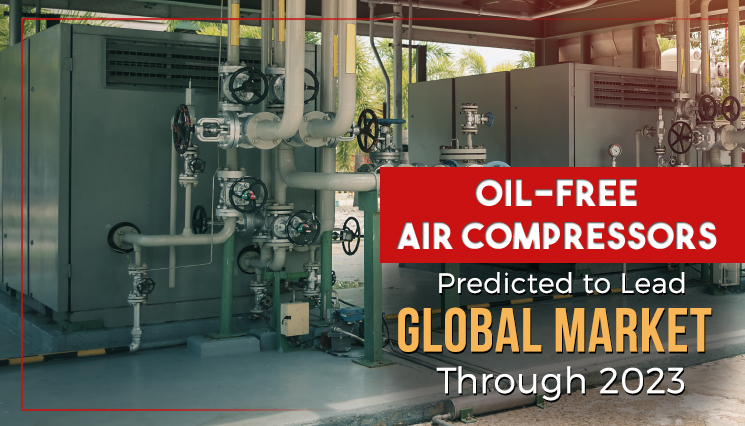 Oil-Free Air Compressors Predicted to Lead Global Market Through 2023 | Compresstech Resources, Inc.
A growing need for increased efficiency has resulted in the fast growth of the oil-free air compressor market. Allied Market Research reports that the oil-free segment, which led the market in 2016, will maintain this lead until 2023. Its compound annual growth rate (CAGR) will sit at 4.77%, higher than that of oiled air compressors, during the forecast period. The global air compressor market as a whole is predicted to reach $26.85 by 2023 with a CAGR of 4.47%. For comparison, it generated $19.79 billion in 2016. Factors that will most likely boost the growth of this market include advancements in air compression technology and a rising preference for rugged, energy efficient equipment. Lucrative opportunities for further growth will also surface thanks to increasing production activities in Asia-Pacific and Latin America, Middle East, & Africa (LAMEA). On the other hand, the high costs of installing and maintaining such equipment may hamper this growth. Stationary air compressors earned half of the total market revenue in 2016. This segment is expected to remain dominant over portable air compressors through 2023. It will have a CAGR of 4.69% from 2017 to 2023. Meanwhile, rotary air compressors generated the highest market share in 2016. They are expected to continue dominating the market through 2023 with a CAGR of 4.94%, beating out reciprocating air compressors. Find more posts about the latest updates in the air compressor market in our newsroom.